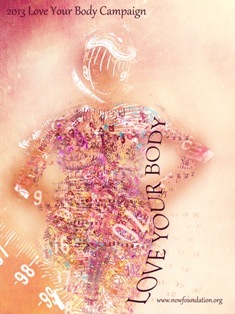 We are thrilled to reveal the 2013 Love Your Body poster contest winner, designed by Natalia Kiss of Srbobran, Serbia! We are also proud to announce that posters and other Love Your Body products are available for purchase online with credit card. Check it out and make sure to make your purchase in time for Love Your Body Day 2013 (October 16). If you have any questions or comments concerning the new ordering process, please let us know by emailing health@now.org. We would also love to hear about any events you are planning on your campus or in your community. Don't forget to use #lybd on Twitter! Keep an eye out for next week's News & Action Summary for news about an exciting Love Your Body Day event.